Baby's largest organ is sensitive and when it emerges from the protective cocoon of the womb, baby skin needs to adapt to its new environment. Luckily for us infant skin is highly adaptable, but has to overcome some common skin conditions. Some of these baby skin conditions, baby acne, cradle cap, heat rash and sunburn can be treated with basic regular baths complimented with natural, organic baby skin care products. Newborn baby skin care should begin with the knowledge that your baby skin loses moisture quickly, so there is no need to give baby a daily bath. It's best to give baths every other day to give sensitive skin time to retain adequate moisture. Umbilical cord care: Baby's umbilical cords usually falls off around the second or third week after birth and sometimes as early as the first week, so keep the area clean with rubbing alcohol and a cotton swab whenever you change to avoid infection from soiled diapers. Cradle cap: Use a gentle strokes and a soft brush to clean the scalp and apply a natural moisturizer like Calendula Cream to help keep the scalp clear of cradle cap. Avoid talcum powder as it absorbs the moisture from the baby's skin. Baby acne shows up after a few weeks and continues for a couple of months or more. Since this is a normal condition and goes away soon it's not necessary to treat these small bumps unless they become infected, just keep a close eye and maintain regular baby baths complemented by organic skin care treatments to keep baby skin from drying out. 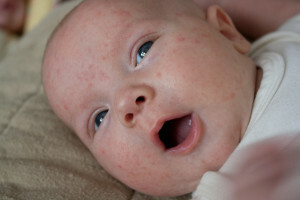 Heat Rash: Baby's new skin is learning to accommodate and live in its new surroundings. A cool bath and breathable fabric like organic Egyptian cotton clothing should help. Don't overdress in hot weather as this can exacerbate the heat rash condition.